Acumen Fund is a non-profit venture capital fund that invests patient capital to strengthen and scale businesses effectively serving the poor. The organization also believes that “a unique pool of talent comprised of individuals who have the operational and financial skills combined with the moral imagination necessary to create innovative solutions to global poverty” can help strengthen these transformative businesses. The year-long Acumen Fund Global Fellows program achieves this by selecting well-qualified individuals and placing them in the organization’s investments around the world, giving them the necessary skills and support to work in the field for nine months and ultimately fostering a corps of next generation social sector leaders. One of these leaders is Benje Williams, who has been working on the ground in Lahore for Acumen investee Pharmagen Healthcare Limited. Benje, a California native, came to Pakistan with a management consulting background and experience in Kenya and South Africa. He is currently working to develop and implement a marketing strategy for Pharmagen, a company that provides safe, clean, and affordable drinking water to low-income residents in the city. The need for clean and safe water is great. According to USAID, water and sanitation related diseases are responsible for 60% of the total number of child mortality cases in Pakistan, with diarrheal diseases killing over 200,000 children under-five years old every year. In total, water-borne diseases cause 40% of illnesses in Pakistan. Pharmagen Healthcare (Pharmagen Limited has been operating for 20 years, but Pharmagen Healthcare was launched only five years ago) aims to tackle this problem. Its chain of shops extracts water from underground, purifies it through a Reverse Osmosis plant, and re-mineralizes it. Water quality is then checked to WHO Standards, and affordably priced for low-income customers in Lahore. 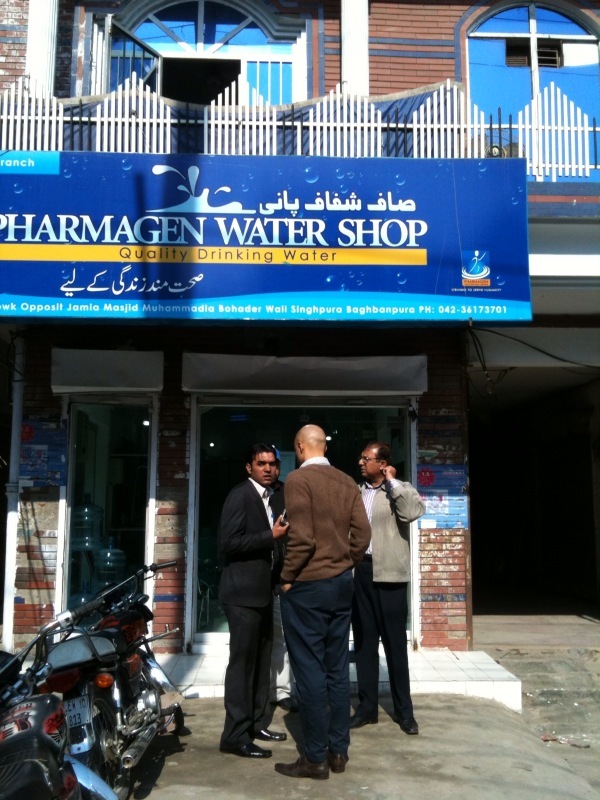 In 2010, Acumen Fund made a $1.5 million investment in Pharmagen Healthcare, which will allow the company to scale their water shops fromfour to 30 by the end of this year, supplying half a million people with clean water daily. A cohesive marketing plan is key to making this investment a success and helping the company expand. Since arriving in Lahore four months ago, Benje has performed market research and analysis to further understand customer expectations and preferences in the communities Pharmagen Healthcare serves. In order to communicate Pharmagen Healthcare’s message and build trust within the community, we needed a more informal, rural-like approach. The strategy, now in its implementation stage, will involve tactics like posters, in-shop promotions, partnerships with local businesses and school outreach. This tailored strategy is a testament not only to Acumen and their close relationship with their investees, but also how important it is for social enterprises to understand the nuanced need of their low-income customers. Benje noted that going into the field – talking and listening to customers, as well as researching competitors – helps to enlighten discussion with Pharmagen Healthcare’s management team, strengthening the business’ market-based approach, as well as his own understanding on the ground. I think one of the biggest surprises has been from a religious perspective, how similar Christianity and Islam are. The appreciation and respect I have received from friends in Pakistan has been very encouraging and a very pleasant surprise. Having previously worked in Kenya, Benje noted that he is also encouraged by the potential of the social enterprise space in Pakistan. “A large majority of Pakistanis may not yet know about social enterprise, but they could potentially be really interested in this space. From a cultural and religious perspective, there is already a strong conviction to tackle social justice issues, to help your neighbor. There is therefore potential to expand upon the pure charity approach to also gain support for Acumen Fund’s model,” which takes the best of charity and the markets. Pharmagen Healthcare epitomizes this hybrid entrepreneurial approach, and, with Acumen’s investment and support from its fellows program, will undoubtedly have a long-term and sustainable impact among low-income communities. How’s that for moral imagination?